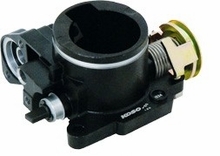 High Performance Honda Grom Throttle Body at 34mm compared to 30mm stock. Much needed part when doing bog bore kit (cylinder upgrade) or exhaust to allow more air to flow. KOSO parts are top notch with great fit adding performance you did not have before.